Barry James first saw Mark Mustoe at a bar in Portland. “I was in town for work,” Mark says. “I was on a date with this other guy,” Barry responds. It was a movie moment. Barry says he felt instantly drawn to Mark, and not necessarily in a sexual way at first. Barry bailed on his date, pretending he needed to get an early start in the morning, and walked out into the night, looking up and down the street for a sign of Mark. That was eight years ago, roughly. Time tends to fly when you’re shuttling between PDX and GEG for a couple years, then bringing your households together around a love of family and renovating Craftsman houses (and the occasional duplex). 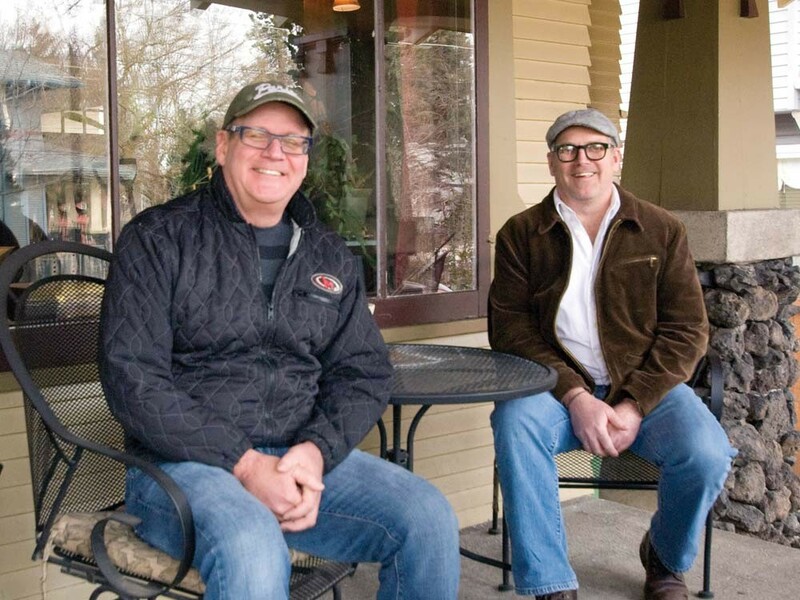 The pair — and they’re very much a pair; Mark leaves voicemails that say, “Hi Luke, it’s Mark and Barry” — have lived together in Spokane for most of the last six years, developing a network of friends and family that stretches from Spokane to the Panhandle. When we sat down to brainstorm committed relationships to profile, we couldn’t think of another couple — gay or straight, young or old — who exude the joy of long-term fidelity the way Mustoe and James do. Capable of brightening up rooms individually, they become completely incandescent together. It was reassuring to learn, on a recent evening, over wine in the gorgeous South Hill Craftsman they’re midway through renovating, that this effortless-seeming relationship requires work and is susceptible to the same doldrums and ruts as other, less inspiring, partnerships. Barry had recently gotten out of a relationship that night in Portland, when he was drawn by a momentary glimpse of his future partner from across a crowded bar. Before that, he had survived the trauma of losing someone. Barry’s longtime partner, Ray, died of prostate cancer in late 2001. Before his death, Ray had introduced Barry to a man named Frank, almost as a way of telling Barry it was OK to move on. Frank didn’t work out well. He lost 50 pounds from the stress. And though the relationship with Ray lasted until the man’s death, it was far from a fairy tale. Ray had hid his sexuality and, when out together in public, wanted Barry to do so as well. Barry was in his late-‘30s then and feeling good about the person he was. He eventually put his foot down. “I finally said, ‘No, I’m out and I’m proud.’” He realized values were as important as chemistry, and this guy he was on a date with wasn’t working on either level. And when it came time to discuss moving in together, talk centered on Spokane and not the much more gay-friendly Portland, because of the kids. He moved despite skepticism (“Spokane is a wet paper bag in winter,” Barry remembers thinking) and gained friends over long nights at Cavallino Lounge, the Elk and the Baby Bar. Barry now feels at home on Mark’s turf. “I belong here and I like it here,” he says. Back in Portland that first night, Barry walked into the street and looked around. “I thought, ‘He’s either gone to this bar or that bar, the good bar or the bad bar,’” Barry recalls, “‘He looks like a good person, so I’ll try the good bar.’” After a moment of deliberation, Barry picked the right bar. Then, in a number of ways that wouldn’t have been obvious at the time, he chose the right line. Mark begins to tell it — “Barry walked in and said …” — but Barry chimes in: “I said, ‘Hi, I’m Julie, I’ll be your cruise director.’” That’s been true for much of the last eight years. And while neither man points to any unnavigably rough waters, you can only circle the Caribbean so many times before St. Kitts starts feeling like Kelowna. At this point, the pair say, it’s not elaborate romance that helps freshen things up, it’s community and companionship and trying new things — gardening, for example, and canning. The couple say that, at some point, the mind stops wondering if the grass might be greener elsewhere and begins to train on the beauty of the pasture you’ve cultivated together. “We respect each other. We want good things for each other,” Mark says, and that’s enough to see the thing through whatever trials may come. This happens by trying a lot of things that don’t come to mind in the idylls of youth, like learning to make sauerkraut, if necessary.